Very Good; 1916 Ladies Home Journal Baird-North Mail Order Jewelers Magazine Advertisement. A Gift Power You Should Utilize This Christmas. Save, Buy Quality Christmas Gifts, Direct From the World's Largest Mail Order Jewelers. Baird North Co. , Providence, Rhode Island. Ad is 8" high and 3" across. Very good condition, suitable for framing. 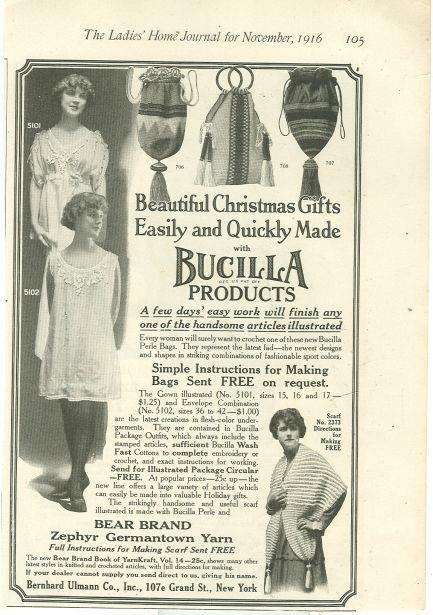 Very Good; 1916 Ladies Home Journal Bucilla Products Magazine Advertisement. Beautiful Christmas Gifts Easily and Quickly Made. Bernhard Ullman Mew York. Ad is 7 1/2" high and 5 1/4" across. Very good condition, suitable for framing. 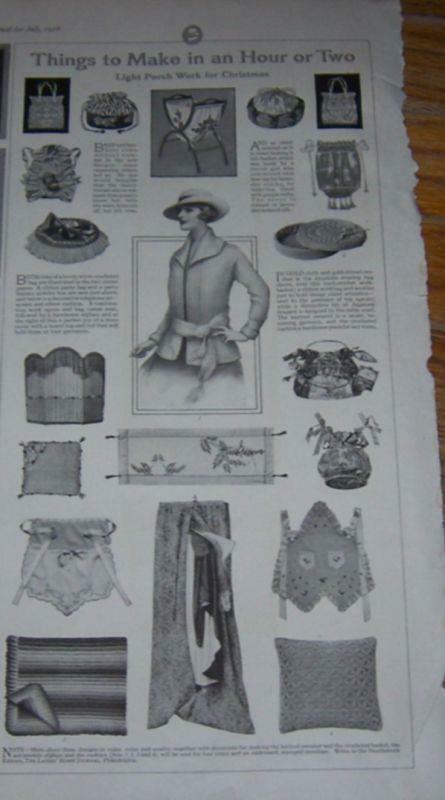 Very Good; 1916 Ladies Home Journal Magazine Page for Curtis Magazines for Christmas. Page is 16" high and 2 1/2" across. Very Good Condition suitable for Framing. Very Good; 1916 Ladies Home Journal Magazine Page for Things to Make in a Hour or Two, Light Porch Work for Christmas. Page is 16" high and 7 1/2" across. Good Condition suitable for Framing. Very Good; Save, Buy Quality Christmas Gifts, Direct From the World's Largest Mail Order Jewelers. Baird North Co. , Providence, Rhode Island. Ad is 10 1/2" high and 2 1/2" across. Very good condition, suitable for framing. 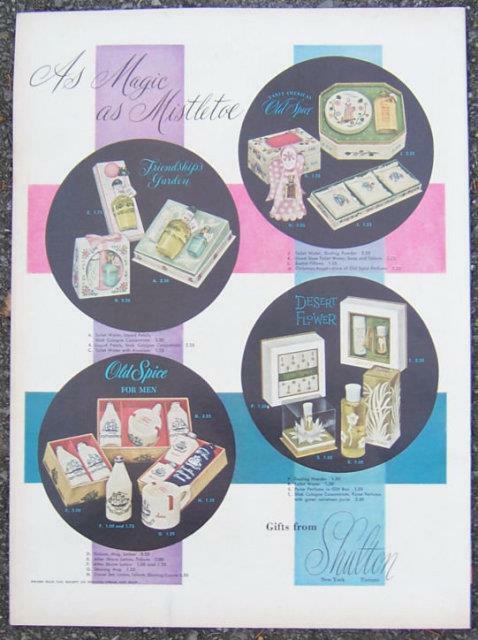 Very Good; 1952 Gifts From Shulton Life Magazine Color Advertisement. Ad features Gift Sets of Friendship Garden, Early American Old Spice, Old Spice for Men and Desert Flower. As Magic as Mistletoe. Ad is 13 1/2" high and 10 1/2" across. Very Good condition, slight wear at edges. Suitable for framing. Very Good; 1952 Jergens Lotion Life Magazine Advertisement. 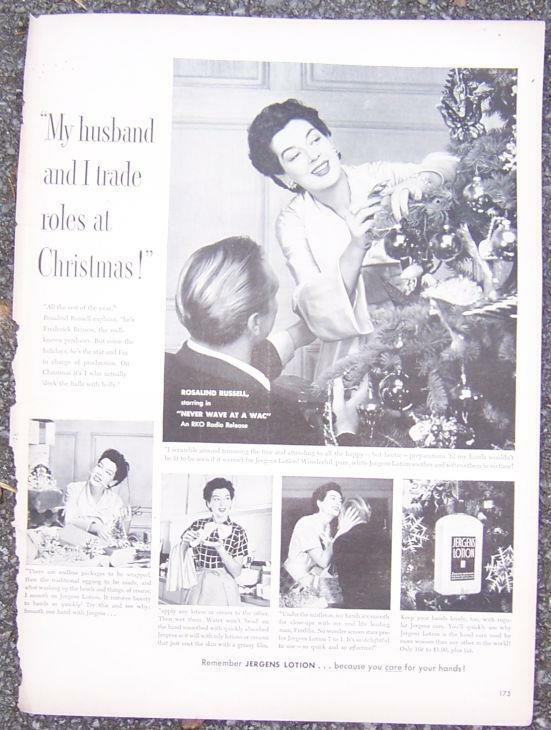 Ad features Rosalind Russell, Starring in Never Wave at a Wac, Getting Ready for Christmas. Ad is 13 1/2" high and 10 1/2" across. Very Good condition, slight wear at edges. Suitable for framing. 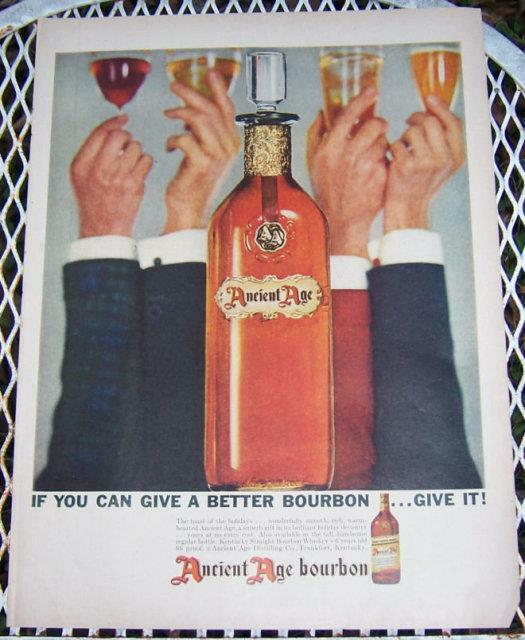 Very Good; 1956 Ancient Age Bourbon Life Magazine Advertisement. If you Can Give a Better Bourbon Give It. Ad is 13 1/2" high and 10 1/4" across. Very Good condition, wear at edges. Suitable for framing. 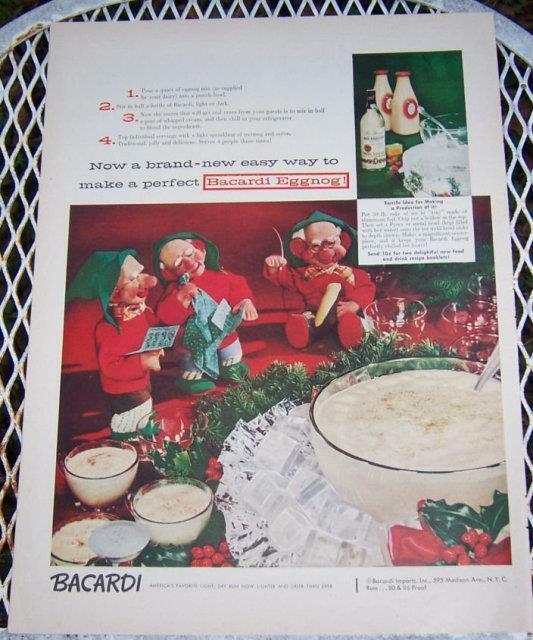 Very Good; 1956 Barcardi Eggnog Life Magazine Advertisement. Now a Brand New easy Way to Make a Perfect Barcardi Eggnog. Ad is 13 1/2" high and 10 1/4" across. Very Good condition, wear at edges. Suitable for framing. Very Good; 1956 Chesterfield Life Magazine Advertisement. 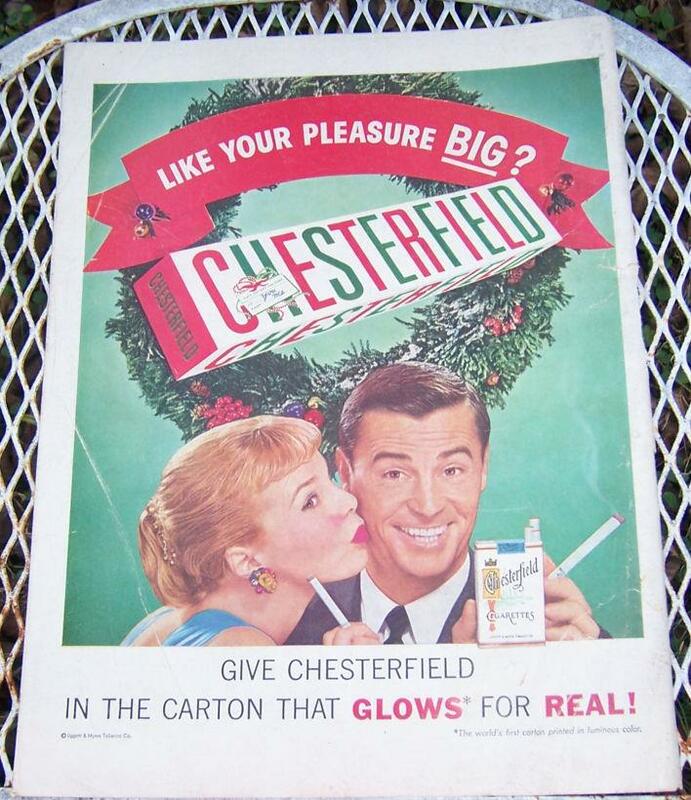 Give Chesterfield in the Carton that Glows for Real. Ad is 13 1/2" high and 10 1/4" across. Good condition, creases in corners. Suitable for framing. 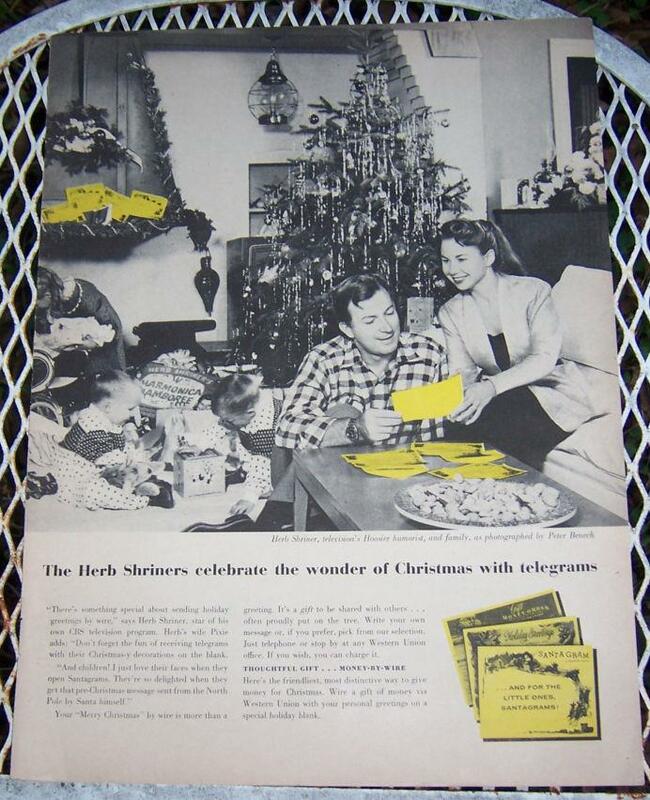 Very Good; 1956 Western Union Christmas Telegram Life Magazine Advertisement. The Herb Shriners celebrate the wonder of Christmas with Telegrams. Ad features Herb Shriner, Hoosier humorist and family as photographed by Peter Benech. Ad is 13 1/2" high and 10 1/4" across. Very Good condition, wear at edges. Suitable for framing. 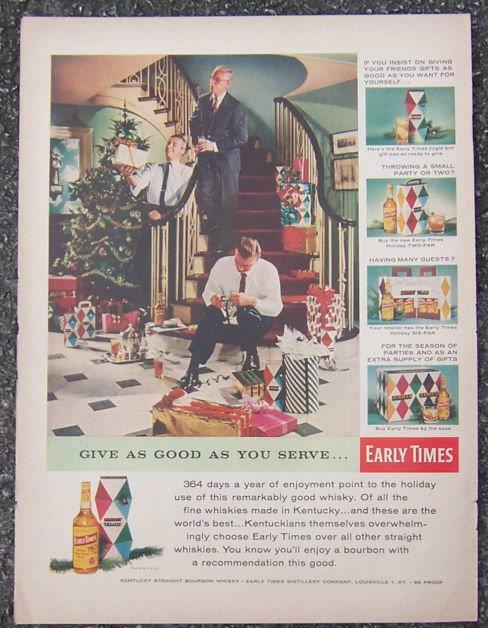 Very Good; 1956 Early Times Magazine Christmas Advertisement. Give as Good as You Serve. Ad is 13 1/2" high and 10 1/2" across. Very Good condition. Suitable for framing. 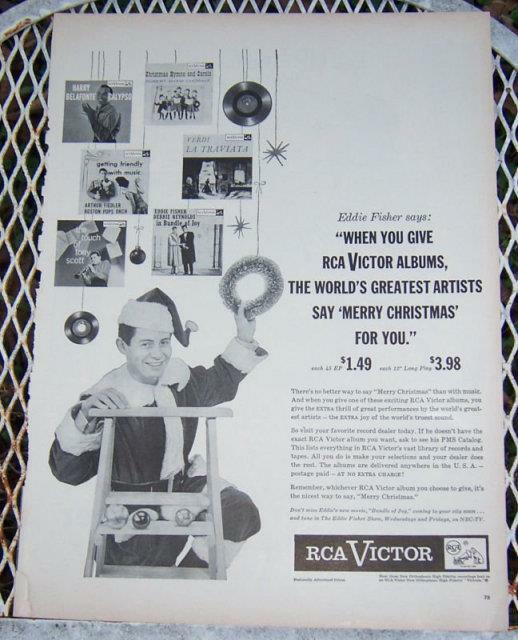 Very Good; 1956 Eddie Fisher RCA Victor Christmas Album Life Magazine Advertisement. 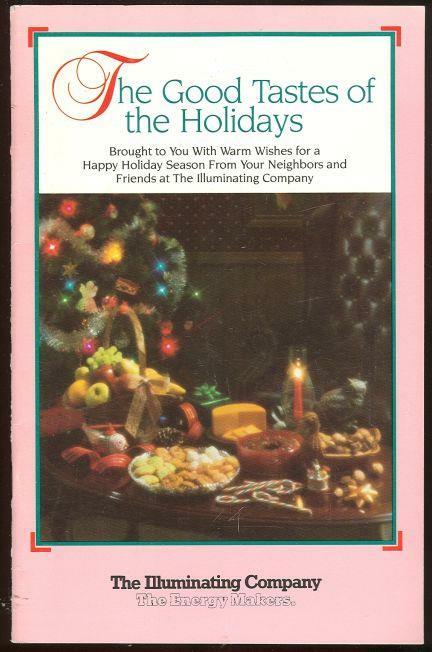 When You Give RCA Victor Albums, The World's Greatest Artists Say Merry Christmas for You. Ad is 13 1/2" high and 10 1/4" across. Very Good condition, wear at edges. Suitable for framing. 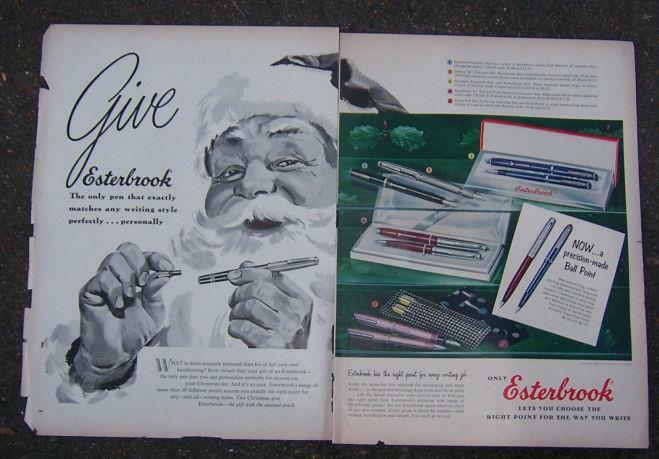 Very Good; 1956 Esterbrook Double Page Life Magazine Advertisement. Give Esterbrook. The Only pen that exactly matches any writing style perfectly...personally. Ad is 13 1/2" high and 20 1/2" across. Very Good condition, wear and tears at edges. Suitable for framing. 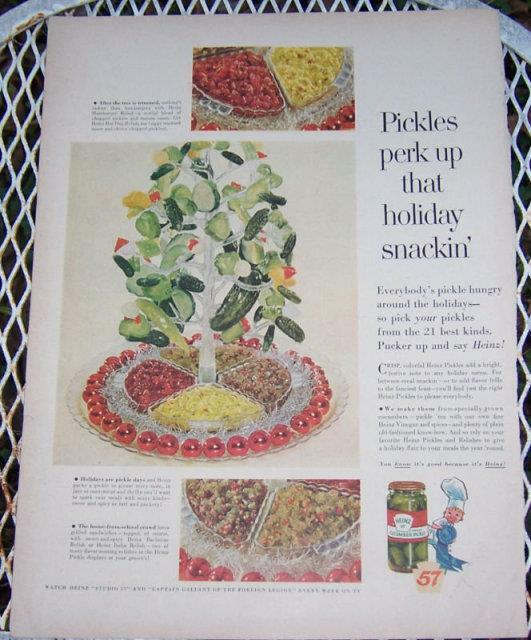 Very Good; 1956 Heinz Pickles Life Magazine Advertisement. Pickles Perk Up that Holiday Snackin'. Ad is 13 1/2" high and 10 1/4" across. Very Good condition, wear at edges. Suitable for framing. Very Good; 1956 Old Forester Life Magazine Christmas Advertisement. Design for Giving. Decanter Designed by Raymond Lowey. You Give so much morewhen you give the year's most advanced decanter and famous bonded Old Forester. Ad is 13 1/2" high and 10 1/2" across. Very Good condition. Suitable for framing.